SFR, Inc. :: View topic - So, who has all the Unseeli Faeries anyway? So, who has all the Unseeli Faeries anyway? Just want two TSR and one promo. Well, I'm excited that I drew my first (SFR) Unseelie Faerie today! A few weeks ago, I was surprised to see Scalders kickers listed as a clearance item on Walmart's website. They only had one in stock, and it included free shipping. So I figured, why not? I might get lucky. Well, I opened it just recently, and there, inside, was my first Unseelie. Hooray! Here's my little sob story. I've been a fervent fan of the game since its first appearance in the mid-90's. I am the busiest Rep in Southern California. I once won the Western Regional Championship at some Bay-area Con that I have long forgotten. I have gotten so many people into this game, and shared a few good fights over the game against people with whom I no longer speak. After all those adventures and misadventures... I have never *NEVER* once pulled an Unseelie Faerie of any type. Thought I�d share a pretty amazing story with you all, apologies if it makes anyone jealous. I recently bid on and won an eBay auction that had two TSR Frost Ogres in it. Some of you may have seen it. I got it for $308. A tad excessive, maybe, but I�d missed too many opportunities to get Frost Ogres in the past, and it was a large lot that I figured I could recoup some losses on by selling the spares on. Anyway, the guy selling it didn�t know what he had. He owns a collectible shop it seems and someone had sold him the dice. He put them on eBay and included 6 photos, which as you�ll find out, didn�t cover all of the dice in the lot. I won the auction and after a lengthy delivery to the UK it arrived! The seller didn�t post to the UK so I got my local shop to help by including it in one of their shipping runs from the states. I went into my local shop (Midlam Miniatures in Pelaw, UK) and had a quick search through. I noticed some TSR Scalders in there, but it had been so long since the auction (2 months) I�d forgotten that they weren�t pictured. I found the first Frost Ogre and as I was searching in the bag of dice for the second, I spotted it. I could not believe it! Did a proper double take! Having read this forum a lot and seen that we only know the location of about 10 or 15 of these, I assumed I would never get one in my life. I got lucky, really lucky. And I think you�ll agree, two Frost Ogres and an Unseelie Faerie is pretty good for $308, given that the last TSR Unseelie Faerie on eBay went for over $1000. Anyway, that�s my little story, hope you enjoyed it. I�m so pleased, still can�t quite believe it! That is a sweet story. What a way to get one... Completely out of the blue. Congrats! At the end of Pax East, my FLGS Pandemonium picked up 6 packs of Scalders. Later at the store, 3 of us each bought 2 of the packs as part of a Sealed Tournament. My 2 packs included an Unseelie, a Will O Wisps, and a Searer! Well, those were my first 2 packs of Scalders ever. I have an SFR reprint. 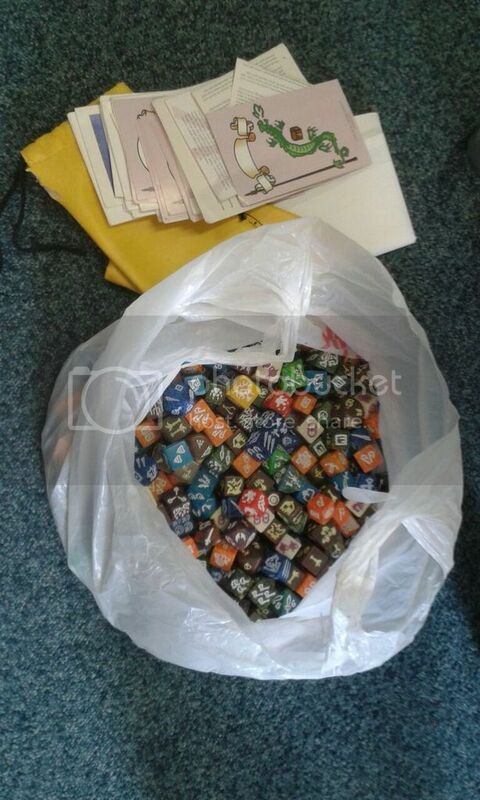 1,275 Dragon Dice™ have found their way into my collection, one of which is now officially discontinued. These are also the dice that I want at the moment. I'll happily trade some promos/originals for their reprint versions. If you're looking for some of these, willing to trade reprints for them, contact me for a list! And two promo Bear Masters! And one promo Frost Ogre! your picture of the Frost orges shows the croocked, Twisted spire that I have seen in many Frost Orges.... so it must in the mold. I thought mine was the only one...then I played a game and saw another one. Even if this List is not updated anymore, i have now one of each kind!